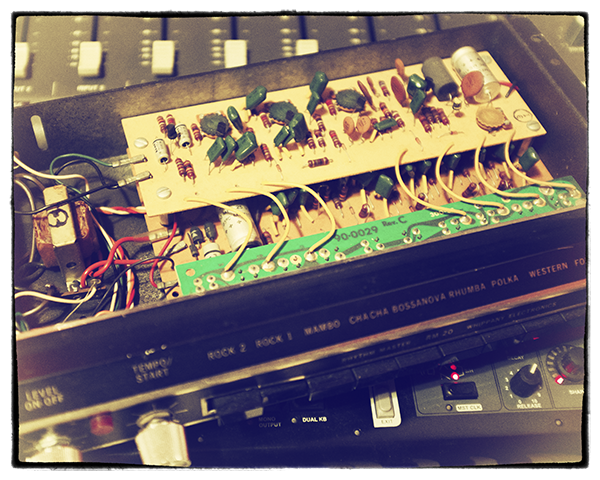 Vintage analogue Kontakt drum machine with customisable Damage • Clean, slightly grungy, badly broken, totally wrecked… you decide! • Individual kit pieces can be crafted and then Damaged to specific levels • Switch between clean and Damaged, or ramp up the Damage, for lo-fi breaks and drops • Convolved twin Spring Reverbs and classic digital effects to add space, and four convolved output speakers for further tone shaping! This began as an impulse purchase gone bad. We spotted a very bent and battered Whippany drum machine at a car-boot sale and Mongo of course swiped it for a tenner. When we got it back to the lab, though, the full extent of the bending and battering was revealed: this thing was, essentially, broken. It spat crusty, erratic hats at us, and the snare drum did a kind of tattered-speaker-cone blort sound. It was while playing around with this that we realised we really liked what we were hearing, and, gradually, the insane notion of Damaged Drums came together. 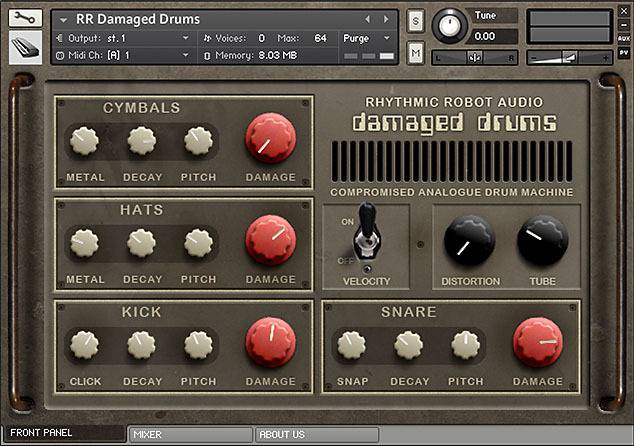 Essentially, Damaged Drums is a fully-functional analogue drum synth with four kit pieces (kick, snare, hats, cymbals), each of which can be tailored with the usual kinds of control over decay, snap, tone and so on. Where things get interesting is with the big Damage knobs. There’s one for each kit piece, and these progressively morph between a clean, punchy sound – think “new from the box”, circa 1960 – and total transistorised meltdown. It’s not a simple crossfade from new to old, either: there’s some behind-the-scenes madness designed to give you all sorts of unpredictable crusty goodness between about the 10am and 4pm positions. 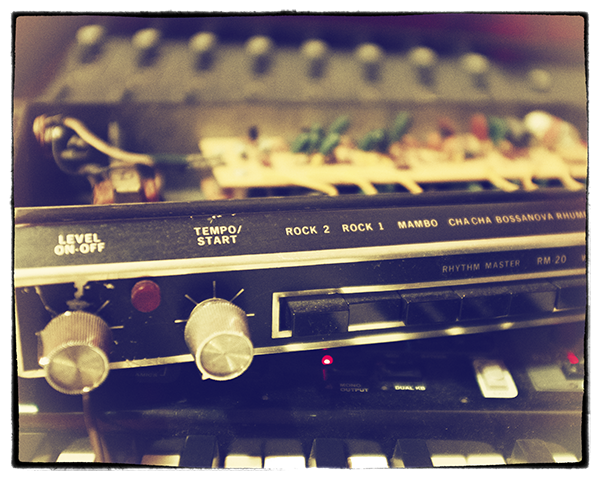 Once you’ve got your basic tones down, you can run them through a neat Mixer pane with tailored EQ for each kit piece, pan control and some really choice vintage reverbs. There are four of these: two Spring settings (one is our Ekdahl Moisturiser, which is quite a long, lush reverb; the other is a Sansui hi-fi reverb amp, with a dark, mysterious tone) and two Digital settings convolved from our Lexicon PCM70. With these you can add anything from a light sheen of classy Lexicon air to a full-on dubstep sproing to your beats. 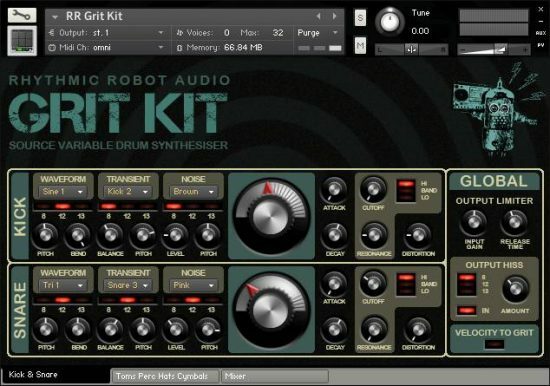 There’s also user-controllable hiss and vinyl crackle, which can be cut in or out and adjusted for level to give your beats that “sampled from raw” vibe. Then four convolved output speakers allow you to shift the tone radically: two of these are hefty great amp stacks, which add beef to the low end, while two are small and tinny – a radio speaker and a little 3″ thing that Mongo trod on. Beats coming through these sound like they’ve been timewarped here from about 1930. Pump the whole lot through the tasty output limiter and you’ve got yourself a party. 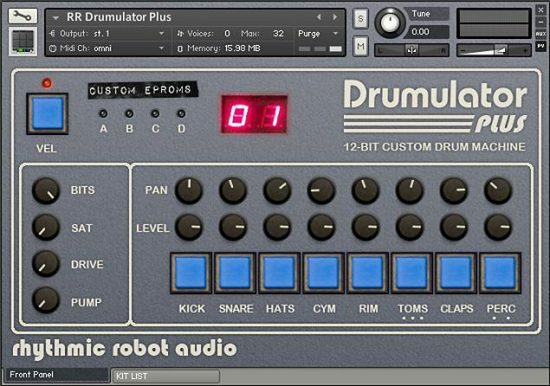 Damaged Drums can either sit back and mimic a variety of vintage flavours (admittedly with a tendency towards the knackered, on-its-last-legs end of the spectrum), or it can go more active: automating the Damage controls in your DAW can bring a real sense of drama to a drum track. Why fade drums out in level when you can fade them back in time?! Why drop the beat out when you can instead muffle it and send it through a broken 3-inch speaker for a bar instead? The creative possibilities of Damaged Drums really lend themselves to left-field artists looking to add something weird and unusual to their palette. Take a listen to the audio demo for a very quick glimpse of a few of the options; then dive in and crank the knobs yourself – just ask yourself, How damaged do I want to be today? 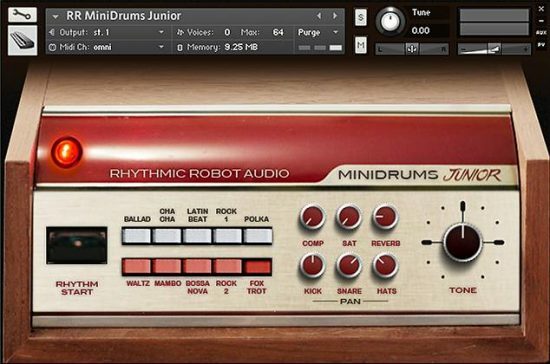 No drum machines were harmed in the making of this product. 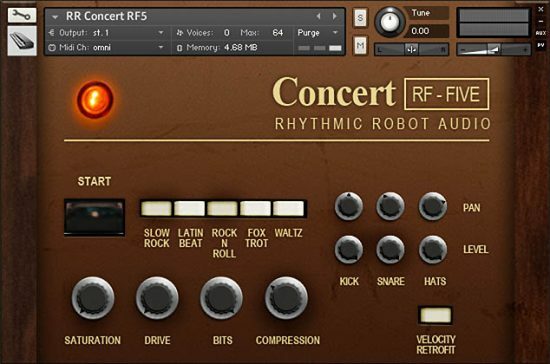 It has become very popular to use gritty, damaged percussive sounds in Scandi-Noir inspired tracks or anything that tries to replicate some of the sounds of the legendary, late Conny Plank. I was on a hunt to find some good samples and landed on this set. These really fit the bill for those percussive accents that sit in the background of the mix, yet draw your interest, as a listener, immediately. There’s something about these sounds that seems to inject a certain dystopian drama and feeling into your music. When you want to make things sound urban, industrial and alienated, a few damaged drum hits can really lift the production values of your track. A little is just enough. I’m glad I found this one. Love it. Got this and Grit Kit, and they work wonders together.